The bill is House Resolution 2454, imposing a domestic carbon emissions cap-and-trade program on the American economy. The goal seems to be nothing short of eradicating American farms and self-sustainability. Even DEMOCRATS are opposing the Obama Energy Bill. Climate change legislation will be utterly devastating for American farmers. Rep. Leonard Boswell (D-IA) of the House Agriculture Committee says that not only will he not vote for it, but no one else on his committee will support it either. The bill would increase the cost of everything that farmers depend on, such as diesel fuel, gasoline, fertilizers, pesticides, and a host of other things. It would raise taxes on energy by $846 billion over the next ten years. Due to the fact that farming is so energy intensive, one major study shows that it would reduce farm income by $8 billion or 28% over the next four years, by $25 billion (or by 60%) through 2024, and by $50 billion (or by 94%) by 2035 [source: Heritage Foundation study]. Many are shaking their heads in amazement over the proposed impact. Cap and trade legislation would utterly devastate the agricultural community with stratospheric operating costs, and would just as utterly destroy rural America. To make matters even worse, the 1,000 page bill pushed through by Henry Waxman and Ed Markey has barely been examined in spite of its sweeping consequences as Democrats play cutthroat politics with America’s future. Nevertheless, Nancy Pelosi is trying to rush the bill through the House, demanding that it be finished by the end of next week – leaving almost no change lawmakers could change it. And Barack Obama is pushing hard to impose his agenda before Americans have a chance to know more about it and oppose it. “The $846 billion price tag on emission allowances, borne disproportionately by oil consumers, will drive up costs of producing and refining gasoline, diesel, and other fuel products while doing nothing to protect fuel consumers, including American families, trucking, the airlines, the construction industry, and many other businesses that rely on oil to make or transport products,” Gerard said. 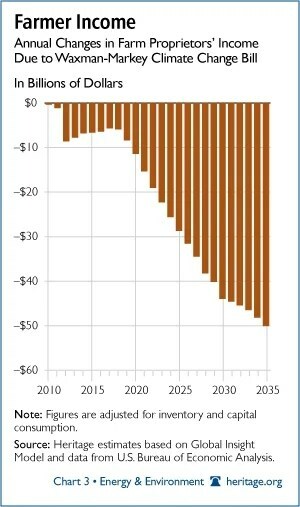 API said that based on allowance costs in CBO’s study, impacts could be as much as 77¢/gal for gasoline, 83¢/gal for jet fuel, and 88¢/gal for diesel fuel. The bill was cosponsored by Reps. Henry A. Waxman (D-Calif.), chairman of the Energy and Commerce Committee, and Edward J. Markey (D-Mass. ), chairman of the committee’s Energy and Environment Subcommittee. • Farm income (or the amount left over after paying all expenses) is expected to drop $8 billion in 2012, $25 billion in 2024, and over $50 billion in 2035. These are decreases of 28%, 60% and 94%, respectively. • The average net income lost over the 2010-2035 timeline is $23 billion – a 57% decrease from the baseline. • Construction costs of farm buildings will go up by 5.5 percent in 2025 and 10 percent by 2034 (from the baseline). • By 2035, gasoline and diesel costs are expected to be 58 percent higher and electric rates 90 percent higher. • The cost of producing everything from wheat to beef will increase. Indeed, the price deflator for private farm inventories goes up over 20 points by 2035. This increase gets quickly translated into much higher food prices for consumers at the grocery stores. Most of our readers know cap and trade is an energy tax in disguise. The goal of cap and trade is to drive up energy costs so much that Americans use less. But there’s a fundamental problem with this. Just about everything we do and everything we consume uses energy, so even after consumers turn up their thermostats in the summer and down in the winter, consumers are still using a lot of energy. But under a cap and trade, they’ll be paying an exorbitantly high price for it. Farming is no exception; in fact, farming is very energy-intensive, with fuel, chemical, electricity and fertilizer costs. They have to purchase a lot of equipment and have to construct a lot of buildings. The Heritage Foundation’s CDA estimates that the price of constructing farm buildings will go up by 4.5 percent in 2024 and by over 10 percent in 2034 (from the baseline) solely because of the upward pressure cap and trade puts on energy prices. The price of tractors– and every other piece of farm equipment you can think of– will increase as well. Worst of all is what happens to farmers’ net income. Farmers live off their gross income; what they earn in addition to that is their net income or marginal income. Waxman-Markey significantly shrinks farmers’ net income pie. 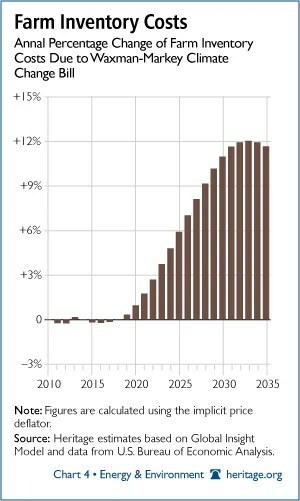 Farm income is expected to drop $8 billion in 2012, $25 billion in 2024, and over $50 billion in 2035. These are decreases of 28%, 60% and 94% from the baseline, respectively. Waxman-Markey increases the costs of farm inventories, which in turn raises the cost of food sold to the consumer. At first glance, this may appear to be a good thing for farmers. Higher prices equals higher profit. But this would only be true if all other things were equal. That’s certainly not the case here. 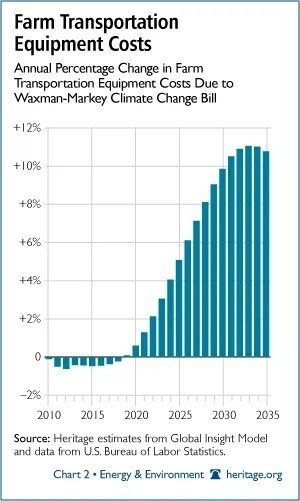 Higher energy prices hurt the overall economy, which means less demand for all goods, less production, higher unemployment, and reduced income. This overall economic slowdown reduces demand for agricultural goods, too. And, as we’ve seen above from the charts, a lot changes for farmers; particularly, their overall cost of operations rise and their net incomes fall. Waxman-Markey’s effect on farmers should raise a red flag for those in the farm belt and will put U.S. agriculture at a tremendous competitive disadvantage if enacted. Consumers will feel the pain as well, not only from the increase in their own energy prices, but increased food prices. And for what? A change in the temperature too small to notice. This won’t just undermine the American farmer; it will force him out of farming altogether. How is it NOT a truly terrible idea to annihilate America’s ability to feed its own people? This goes beyond undermining the US economy; it may well literally create starvation conditions for millions of Americans. “That’s not leadership. That’s not going to happen,” he added. And now we see what Obama’s “leadership” looks like: it looks like a bigger version of North Korea. Nationalizing the auto industry and imposing tiny little clown cars on the country; an energy policy that will tax us into freezing in the dark at night (or conversely sweltering in the summer heat); and of course the whole famine thing. You can’t say he didn’t warn us, I suppose. The beast is coming. That approaching reality is becoming clearer every single day.